a substitute for grassy plants could be mushrooms, or even crystals or burning campfires. Mushrooms might work in addition to the grassy ones. No crystals as it's not that kind of mine, there's something else in there which attracted the bad guys. No use for campfires as the lanterns already have flames in them. So you can turn scanlines on and off? It might be nice for an option to make the scanlines lighter too (like 50 opacity). Yes scanlines can be configured though default is full 100percent on as that's how I like them and wish every low res game had. There is a video menu which at moment can only be accessed at the title screen but I will fix to appear in-game too so you can configure things in realtime to your preference. 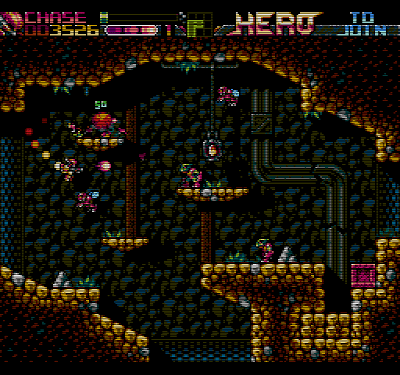 I really like the tiles, their graphics are full of details and the palette is fresh. I hope you will release a small demo soon to see everything in movement and try the gameplay. Nice job! Very much looking forward to it, even just the screenlook is good - I bet the gameplay is even better.